Just a moment ago I was experiencing some anxiety over an interaction I’d had earlier in the day. I started to take my standard anxiety-reducing strategies such as mindful breathing, letting it go and the least effective “Is it true?” dialogue. But then an image popped into my head of a small painting I’d done recently. This one (below), the little Cowichan Bay 5″x7″ quick-painting was a result of Andrew and I jumping out of the car and timing a 45 minute session before the rain came. 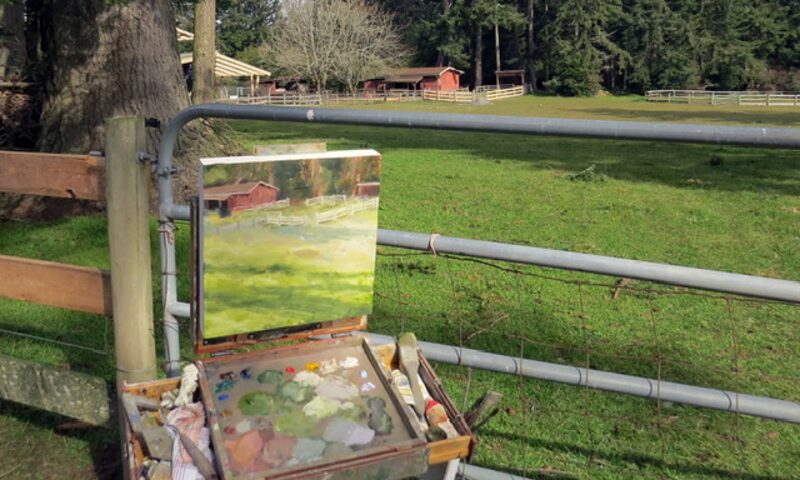 We were on our way home from a great painting morning at Cowichan Lake but weren’t quite finished with painting. That image of the little painting was telling me to paint. Paint away the anxiety. Truly, the best way to focus, to lose oneself, is to be doing and thinking nothing but painting. 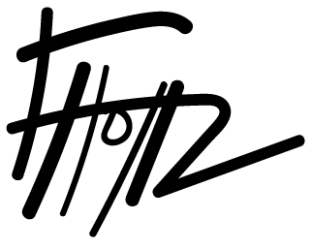 Well, instead I chose to write this post but soon I will be in our small studio; happily and happy in the moment. Soon! Another quick-paint result is this little Arbutus (below). Again meandering our way back from a morning of painting (this time in Sooke), we came to a dead end down a rural street and straight ahead in a sad, empty lot was the most glorious view of two giant Arbutus. 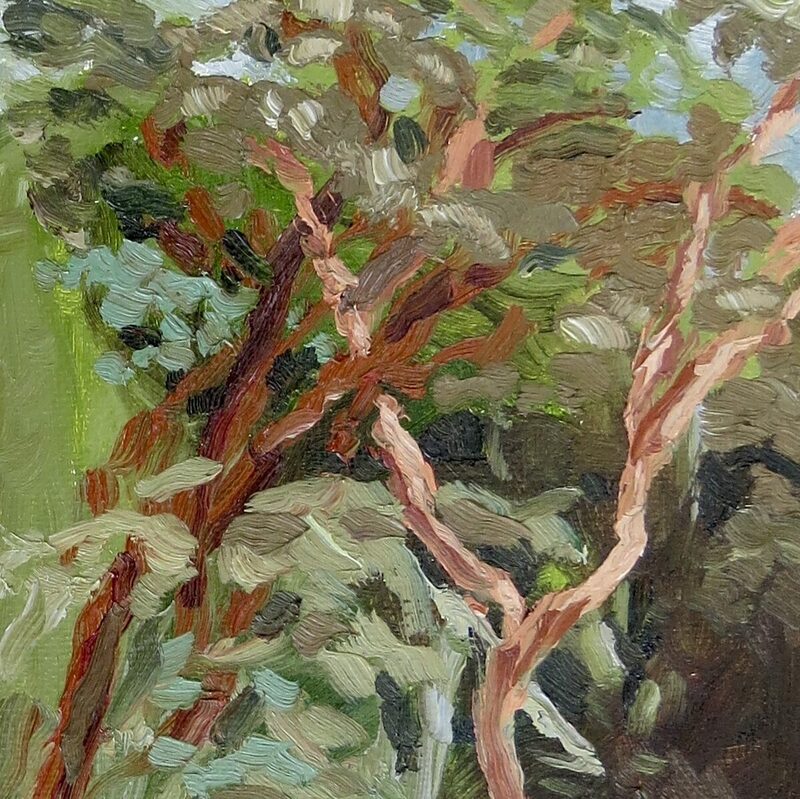 It is not often I get that clear a view of an Arbutus so we stopped to paint for 40 minutes. Painting isn’t always such a pleasure or easy solace. Sometimes it is downright difficult. A struggle from start to finish. Although this one (below) started out easily, it was an uphill climb after that and took a good amount of additional studio time to bring it to a place where I am satisfied… enough. The painting is not a masterpiece, and will likely end up in the bin, but it was a valuable learning tool; reflecting water, simplifying complex organic shapes and background atmosphere. And focus; in the moment, mindful pleasure. And now it is time to stop writing about painting and to paint.